UPDATED – MANILA, Philippines (CNS) — Church leaders condemned bomb explosions that killed at least 20 people and injured about 100 others inside a Catholic church in the southern Philippines Jan. 27. They called the attack a “heinous and evil” act of terrorism. 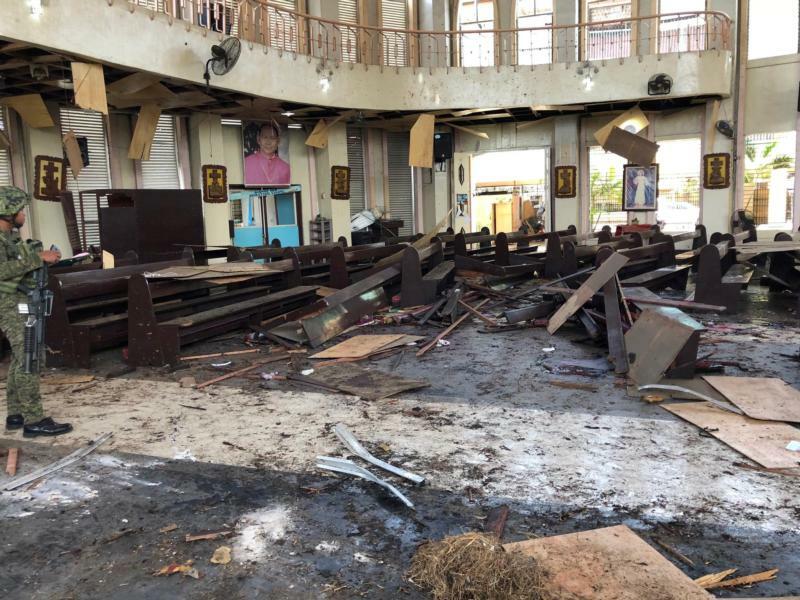 Ucanews.com reported the Islamic State group claimed responsibility for the bombing, which occurred during Mass at the Cathedral of Our Lady of Mount Carmel in the city of Jolo. Islamic State, which often claims responsibility for acts of terrorism, issued a statement claiming two suicide bombers detonated explosive belts inside the church and near its entrance. The first blast left bodies strewn on the floor amid destroyed pews. A second explosion near the entrance shortly after killed at least five soldiers trying to help the wounded. The attack, one of the deadliest in recent years in Mindanao, occurred less than a week after a plebiscite was held on expanding and strengthening an existing Muslim autonomous region in the area. Pope Francis also expressed his sorrow over the attack. “I raise my prayers for the dead and wounded,” the pope said in Panama, where he was attending the World Youth Day celebration. “May the Lord, prince of peace, convert the hearts of the violent and give the inhabitants of that region a peaceful coexistence,” added the pope. Cardinal Quevedo, who retired as archbishop of Cotabato in November, once served as parish priest in Jolo; until he was named the cardinal’s replacement, Archbishop Lampon was apostolic vicar of Jolo. “As former religious leaders of Jolo, we totally condemn the criminal bombing of Jolo cathedral,” their statement said. The attack “on a sacred day and at a sacred moment of worship” was “the action of evil people with utter disregard for the sacredness of human life and of human dignity,” they said. They appealed to the security forces to swiftly bring perpetrators to justice. The predominantly Muslim province of Sulu has long been a hotbed of groups claiming allegiance to Islamic State and al-Qaida terrorist networks. Authorities said the bombing was in retaliation for the death of a leader of the al-Qaida-linked Abu Sayyaf group last year. Lt. Col. Gerry Besana, military spokesman, said investigators had recovered closed-circuit footage of the bombers just before the attack. Mujiv Hataman, governor of the Autonomous Region in Muslim Mindanao, told ucanews.com only Abu Sayyaf, a small militant group associated with Islamic State, had the means to carry out the attack. The Moro Islamic Liberation Front, which entered into a peace deal with the government in 2014, said it would conduct its own investigation. “We are not dividing people. In fact, we are uniting Muslim and Christian people,” said Hadji Murad Ibrahim, the group’s chairman. The Philippine government vowed to hunt down the perpetrators.